Just because you’ve done something once before, doesn’t mean you can do it again – without directions, at least. It’s not long now until we’re off to Wilsons Prom to walk down to the lighthouse. My office day job provides, as you might imagine, ideal training for a 20-24km hike (probably to be repeated 3 days in a row, unless we’re too knackered on the middle day). The slightly downhill 3km walk home of an evening has also really helped to boost my confidence. Even so, we though a bit of extra practice wouldn’t go astray. We’ve been meaning to go back to One Tree Hill and the 1000 Steps for quite some time. The last first and last time we were there was before the ‘new’ Lyrebird track was (re)opened. Today seemed like a good day. Pity neither Stephen or I remembered to pick up Glenn Tempest’s “Daywalks Around Melbourne” in case we couldn’t remember which track to take, based solely on our memories of our walk from a couple of years back. 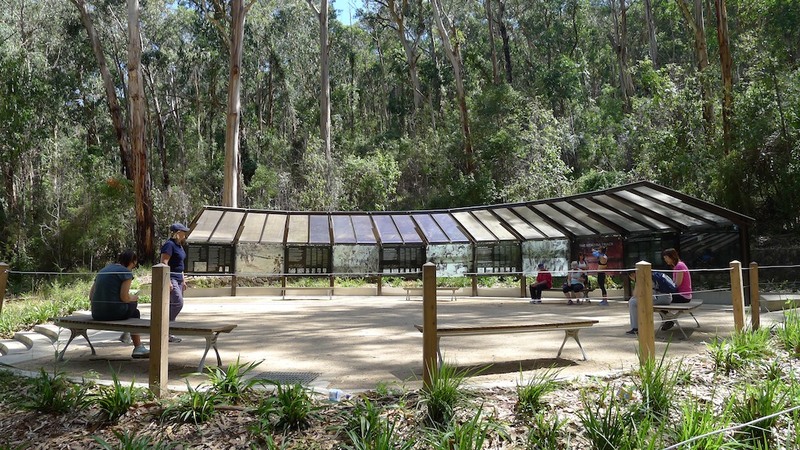 This section of the Dandenong Ranges Nation Park must be one of the most visited of Victoria’s parks. 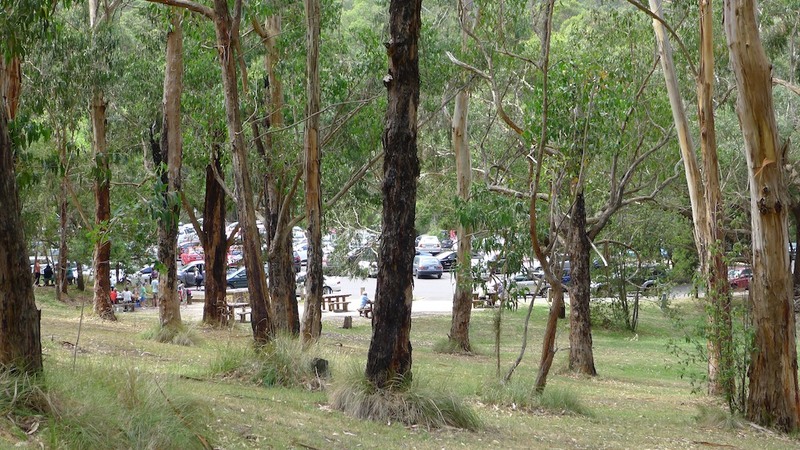 The 1000 Steps car park at the bottom of the hill (Fern Tree Gully end) is very large, but always full. I’ve never been by and not seen cars parked for hundreds of metres up the sides of the road. As suggested by Glenn Tempest, we have always (that is to say both times now) parked at the top at the One Tree Hill car park. Compared to the crowd at the bottom, it’s like hardly anyone seems to know about it. And yet it’s only about 100m (if that) from the end of the 1000 Steps track. Go figure. Just going up and down the 1000 Steps (or Lyrebird) track with half of Melbourne’s population (well, not quite half) is not our idea of a great afternoon, so we like to extend the walk so we can look around, enjoy the bush and get to clock up 10km without collapsing (as I think could be on the cards if we did the same distance just going up and down the ‘Steps). So after finding a park (not hard), changing into our hiking boots (there’s a convenient seat nearby), we walked to the top of the hill to start our walk along Tyson Track. It’s pretty steep going down, even if it doesn’t look it in the photo. 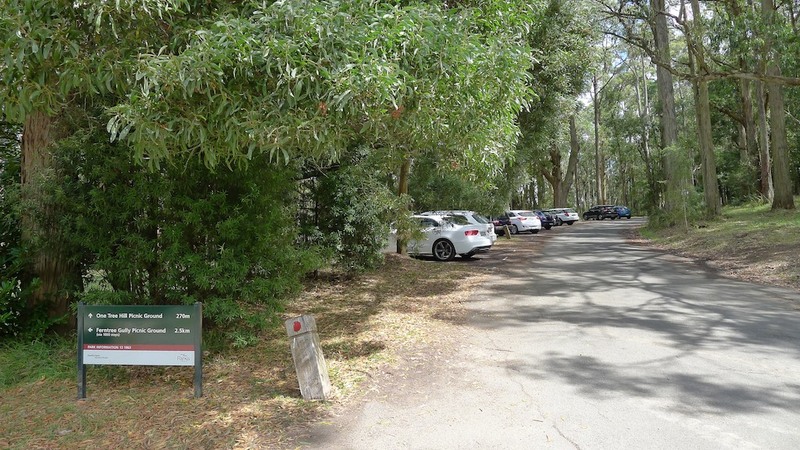 One Tree Hill Picnic Ground – there’s also car parking outside the gate. The bush down the western slopes of One Tree Hill is drier, with less understorey than in the lush and protected gullies, and with grasses as the majority of the ground cover. Numerous tracks crisscross the park. Some follow a level grade as much as possible, and some tracks are very steep (through not as steep as the Telecom Track in Walhalla, thankfully). The tracks are generally wide, gravel-surfaced and well maintained, and it’s not unusual to come across a number of other walkers or hikers and there are signs of mountain bike riders using the tracks, too. In fact, this section of the National Park reminds me of Toohey Forest, just south of Brisbane. View Track – Gravel paths are great until they get steep and shallow – then it’s like marbles on concrete. It’s steeper than it looks. Something I’ve never seen in Toohey’s Forest though is one of these fellows, who was just to the side of The Boulevard (track) as we tried to find our way back up to Belview Terrace. Having descended from the top of the hill, walked some streets while slightly ‘locationally challenged’, climbed almost the whole way back up again while doubling back due to a poor choice of track at Himalaya Road, we eventually found the path we originally intended to be on (Belview Tce). Slightly surprised at the appearance of a police 4wd coming up the track (yes, the paths are that wide and no, I doubt they’d need to put it in 4wd to get up that track… well, maybe to get around some of the corners lower down) we continued down hill again until we reached the 1000 Steps car park and picnic ground. There are public facilities there and even a cafe now. Now, I understand and fully support the principle that what you take into a national park you should also take out. That’s good, proper and the responsible thing to do. But when you buy something at a cafe, you would expect them to have a rubbish bin, wouldn’t you? Apparently not in this case. Again, I understand why – they don’t want to attract birds/possums/rodents etc and encourage unnatural habits – but there’s not even an inside bin. Which isn’t to say that the cafe staff don’t dispose of rubbish left on tables by people who ‘didn’t see’ the signs… Anyway, we took our rubbish with us – it’s not like there was a lack of space in our backpacks! And so here we were. The infamous 1000 Steps (of which I hear there are somewhat fewer than 1000 – I wasn’t counting though). Last time we battled our way up the old, narrow, steep, slippery track with half of Melbourne’s population who are trying to get fit and a couple of bus loads of tourists on top of that. What was the new track going to be like? I think I’ve been told that groups preparing to walk the Kokoda track come here to train. Have I mentioned that the old track is steep? The recent works done around this lower end of the park really emphasise our history on the Kokoda Track. 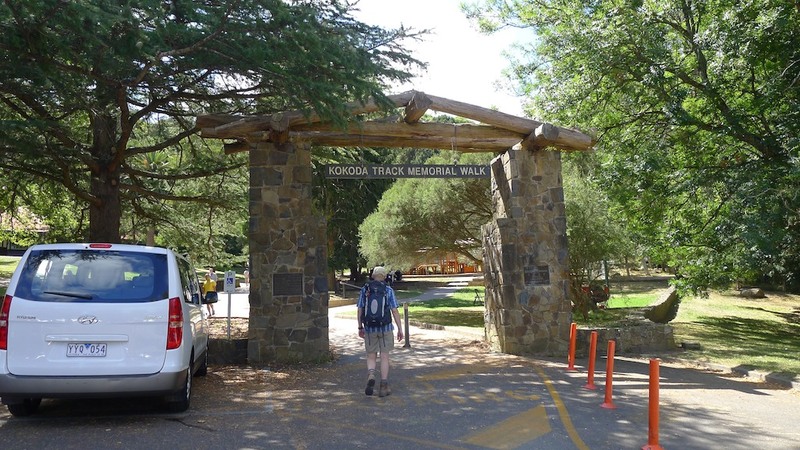 There are information plaques along the Kokoda Track Memorial Walk – aka the ‘old’ 1000 Steps track – but with the human traffic it can be hard to take it in. Having large, dedicated areas down the bottom that you can read before or after your climb seems a good idea. It also gives you something to reflect on while you’re struggling up the hill. And here it is – the spilt. Lyrebird (new 1000 Steps) on the left, the Kokoda Track Memorial Walk (aka the ‘old’ 1000 Steps) on the right. We came to try out the new path, so that’s what we chose. I was surprised at the number of people still heading up the old path. It hasn’t been wet lately – I wonder if that makes a lot of difference? You won’t catch me going up there in the wet. Even with a handrail, those old, mossy, sloped steps do not make me feel safe. In comparison, the steps of the new track – though not as wide as we’d expected – are level, deep and moss free. The new path is 700m longer than the old one (2.5km vs 1.8km), although both are rated as ‘Steep’. And since you get a choice between stairs and path on the Lyrebird Track, after a short while I found the track was definitely easier! As long as you keep to the one line and be aware that you’re sharing the path, it’s pretty good. But still quite a way up. And these signs along the way don’t help. I’ve no idea what they’re measuring. The track is 2.5km long, but the post at the top says 15oom… it’s not elevation – the top of the track is not quite 500m above sea level. 750m? To or from what? Mission accomplished we left the sweaty masses behind and wandered up the last 100m (if that) of the track back to the One Tree Hill car park. By this stage lunch on top of the hill was sounding really nice (we only stopped for a quick snack at the cafe below) and as previously mentioned, there are open and sheltered picnic tables as well as BBQ’s and facilities up top here too. 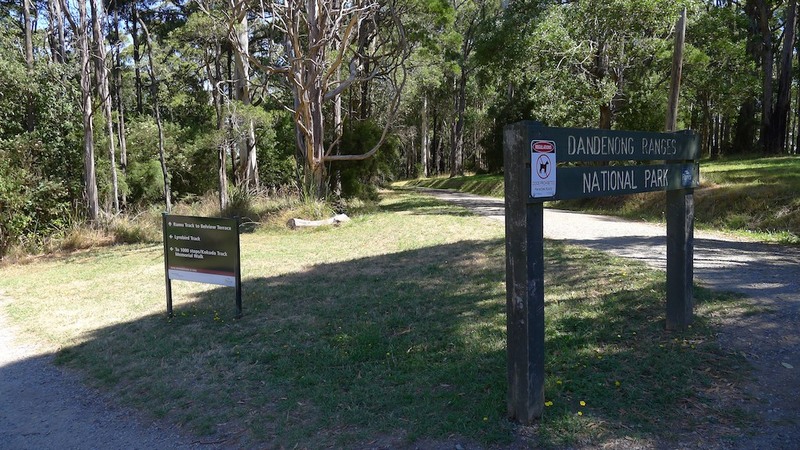 Unfortunately I’m still having issues with embedding our Garmin details, but if you’re interested in a good walk around the Dandenongs, please check it out here – and don’t forget to take a copy of your walk directions with you! 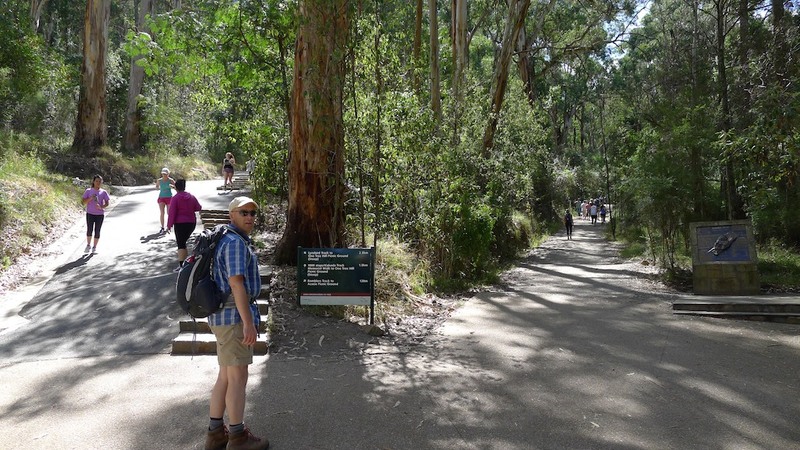 Categories: Weekend walks | Tags: 1000 Steps, bushwalk, Dandenong Ranges NP, daywalk, echidna, Fern Tree Gully, fitness, getting lost, Glenn Tempest, Hiking, Kokoda Track Memorial Walk, Melbourne, One Tree Hill, Parks Victoria, picnic grounds, training | Permalink. Our first destination today was 5 Percy Street, Prospect, SA. Recognise it? Yep, the home of R.M. Williams Pty Ltd.
Not that anything is made at that site anymore – it’s just a shop and museum now, a short but pleasant drive north of the city. The card file system. Details of customers from stockhands to station owners to Prime Ministers are in here. The museum was interesting and I’m glad we visited. The shop… well, somewhat surprisingly there’s a better range of the Australian-made range of clothing in the city stores we’ve visited. 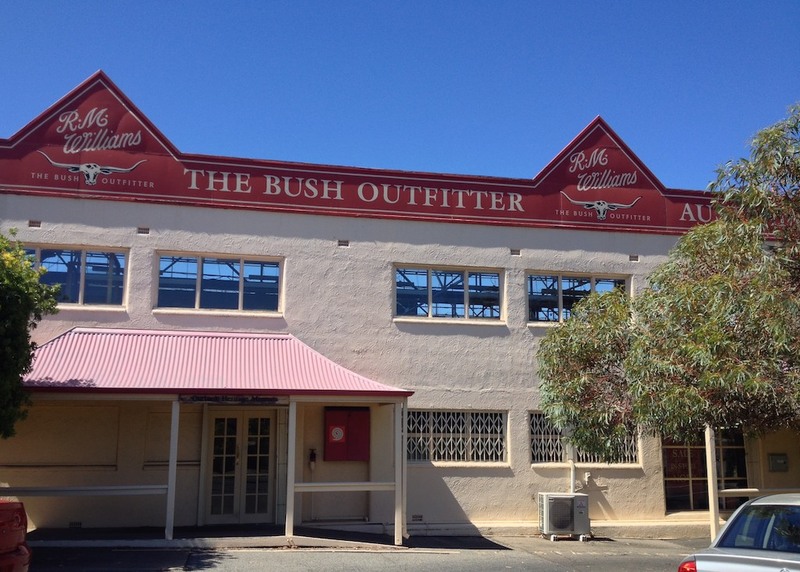 All the clothes here that I could see were the “Bush Outfitter” lines made in China. 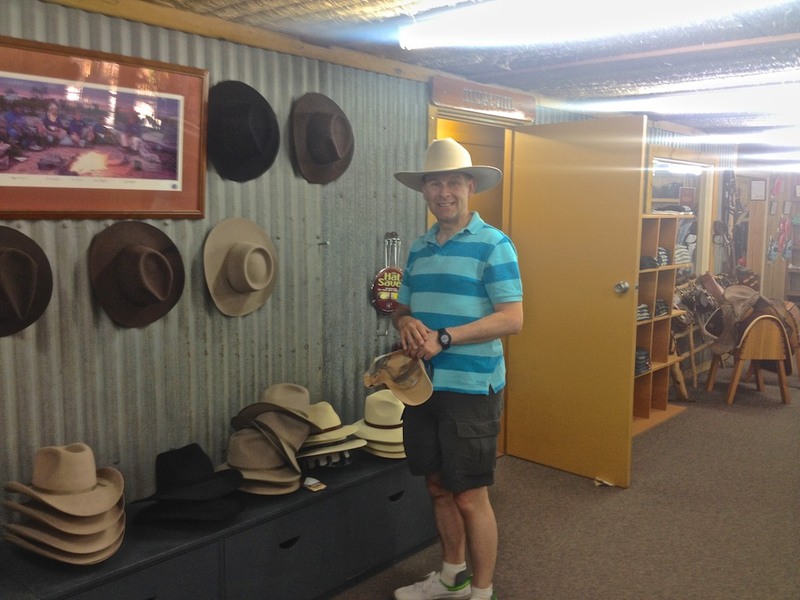 Stephen trying on a ‘Bob Katter hat’. 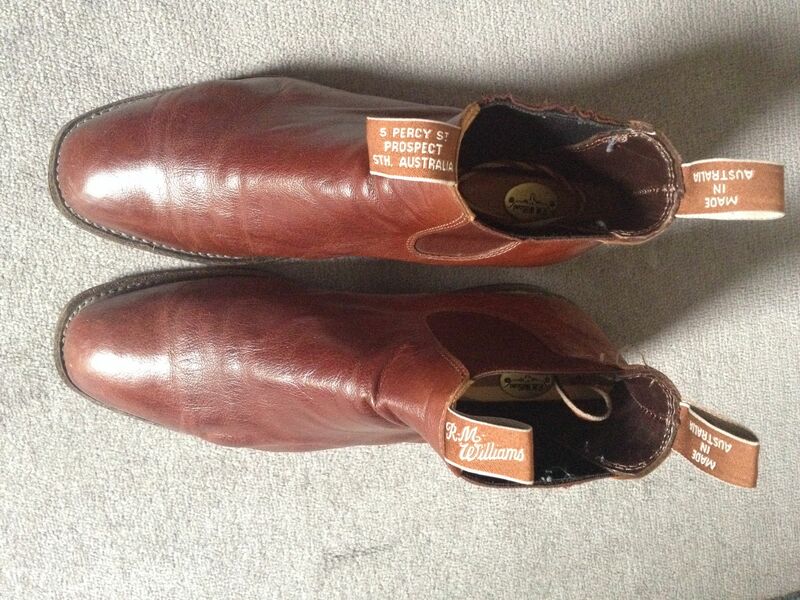 Akubra’s are thankfully still Australian made! Leaving the nicely air-conditioned shop, we ventured forth again, crossing town to head into the Adelaide Hills and the tourist town of Harndorf. As the name suggests there is (or at least was) a significant German population hereabouts. 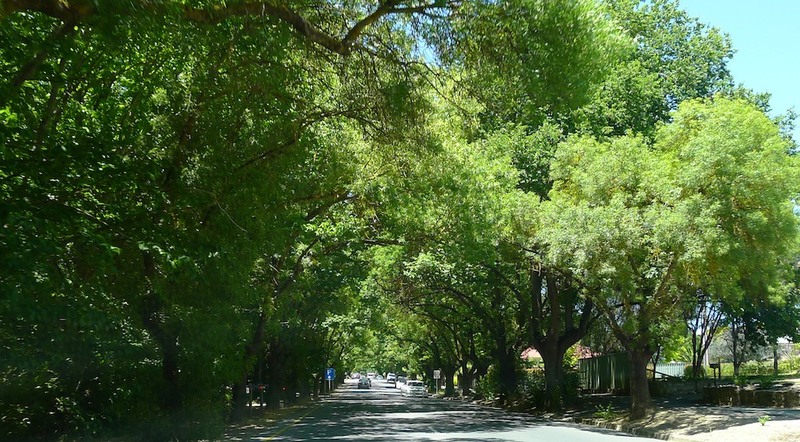 The open eucalyptus forests and stands of tall dark pines give way to an oasis of elms and plane trees as you drive down the main street of Harndorf. It’s as overtly touristy as North Tamborine in Qld, or Olinda in Victoria. And there’s no where to park! Entering Harndorf – shady bliss! We eventually managed to find somewhere on a backstreet that didn’t have a yellow line (indicating no parking allowed) or a time limit, and went to find a cold drink and a light lunch. Udder Delights was just the place! And they serve The Hills Cider, too! Bonus! There’s an interesting mix of shops, galleries (I would have liked more galleries) and many, many purveyors of food – mostly local I think – and a few quirky places for added interest. Taste of Harndorf – Pate anyone? Taste of Harndorf has Rhubru? This is from Tassie… Looks like they’ve changed their label. Check out the size of these freckles! The local Harndorf butcher certainly was into sausages – and displaying all their stock at once. After browsing the main street, and stopping for a refreshing lemon sorbet, it was off to Mt Lofty to see the city from above. 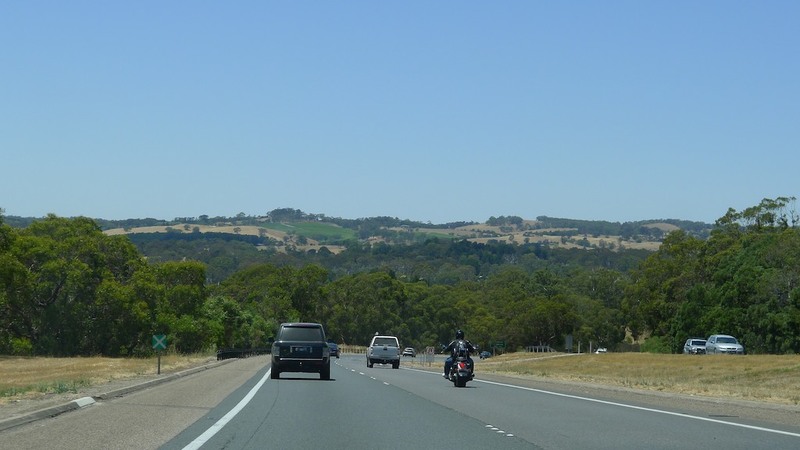 I can definitely recommend going via the Onkaparinga Valley Road to Balhanna, then turning west/left at the sign that says Mt Lofty Tourist Drive (which Google Maps calls both Adelaide-Balhannah Road and Greenhill Road). It’s a lovely drive through country much more as I’d imagined the Adelaide Hills to be. Steep rolling hills, vineyards and orchards everywhere. The only difference was that there’s a lot more eucalyptus forest than I’d imagined. The road is not wide and often there’s no shoulder, so 60kph feels more like 80kph, so do be careful around some of those bends. Mt lofty scenic drive – what a house! 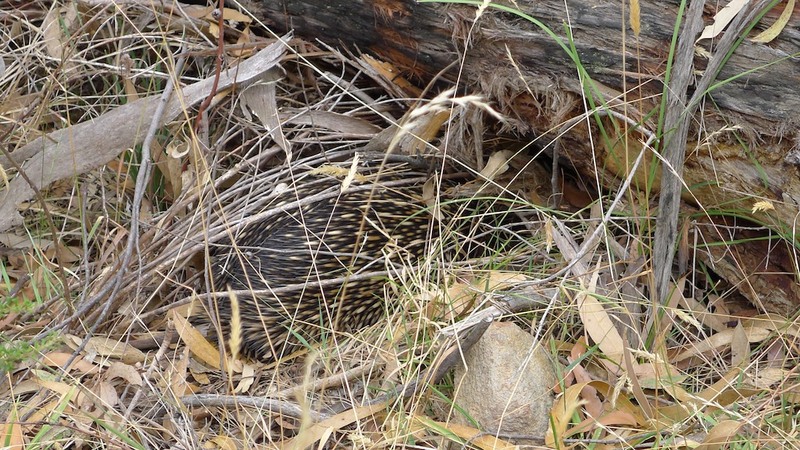 Surprises awaiting us at the summit of Mt Lofty were an echidna and a koala in the carpark, and a public drink fountain/water bubbler in the main viewing area! The water from it wasn’t even hot! There doesn’t seem to be enough drinking fountains around this city that has a reputation for getting so hot, and on a day like today (a very dry 37oC), it was certainly most appreciated. To commemorate Matthew Flinders, who named the Mt Lofty Ranges, there is a lovely tall obelisk known as the Flinders Column (which also provides some welcome shade) standing at the viewing platform. There are signs at the edge of the viewing area to point out notable features in the landscape. At over 710m in height (reports of the exact height varies) the view is excellent, and you can really appreciate just how flat the plain below is. In fact, the only wrinkles in the earths surface is that of the Hummock Ranges, just over 100km north-west of Adelaide at the top of Gulf St Vincent. To the south we could just make out Kangaroo Island. Of the two round buildings seen in photos of the summit (here for example), there’s a restaurant (closed when we were there, with the shutters down) and a souvenir shop that wasn’t too tacky. Mostly the same kind of stuff you’ll find in a lot of the nicer souvenir places around abouts. I’m guessing the “locally handcrafted gifts” referred to by the various webpages and brochures about the location must be referring to some of the products with indigenous designs on them. Nothing else looked like something I couldn’t just as easily buy in Victoria. It would have been nice to go for a walk along some of the many tracks in the area, but it was really quite hot, and we weren’t properly attired – nor did we have sufficient water with us to contemplate such things. Next time, I hope. It definitely looks worth doing. Fortunately it wasn’t supposed to be as hot today as the previous two days; it was predicted to be 34oC with intermittent showers. 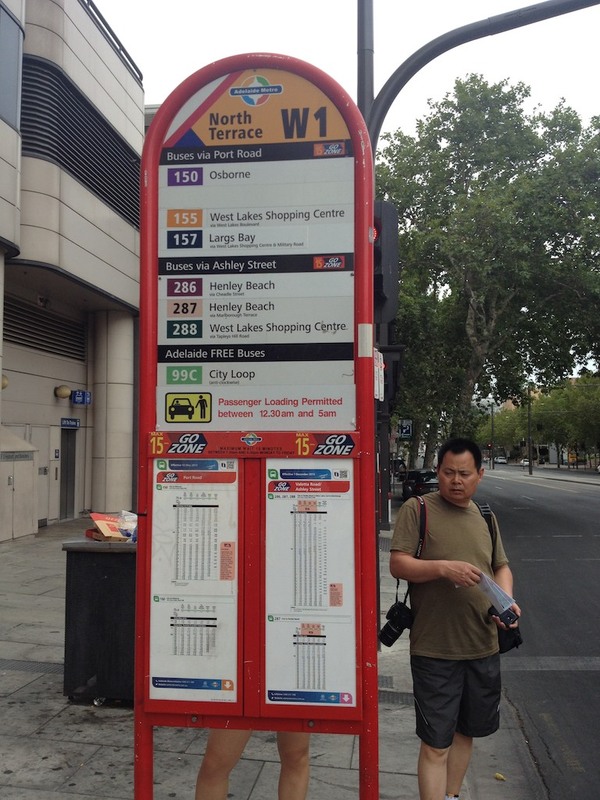 We decided to hitch a ride on the free city loop bus (the 99C) and see more of/around the city to start the day. Alighting at the east end of North Terrace we walked to the South Australian Museum while trying to shoo away the peskily persistent flies. The buildings of the universities we passed are quite lovely, as is the museum itself. 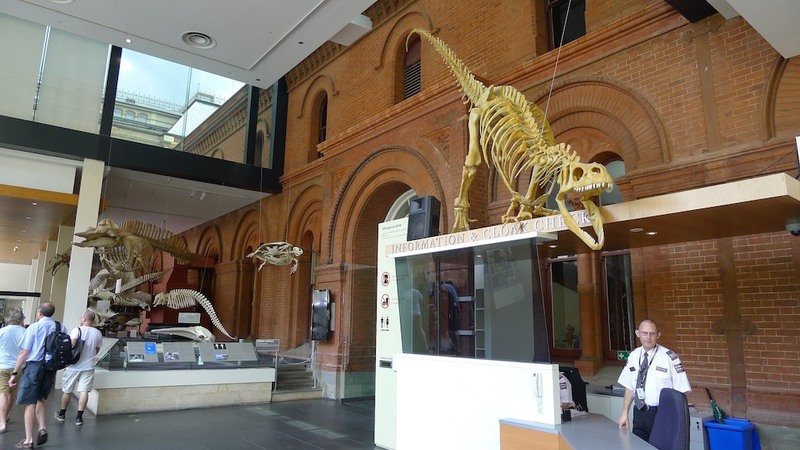 In keeping with museum traditional (it would seem), bones and/or dinosaurs – in this case a combination of the two – greet the visitors. Unlike at the zoo, this dinosaur didn’t move and make noises. The first room on the ground floor that we entered contained what could possibly be a lifetimes work for a taxidermist – and possibly a couple of his/her apprentices, too. And ode to taxidermy, perhaps. Arranged by continent and region, it was an impressive display. This is just a small sample – I didn’t photograph the elephant, or the lion whose tail twitched occasionally, for example. In the old limestone building that is the east wing of the museum, we walked through to an Australian aboriginal exhibition. The lighting was quite dark in here – perhaps to discourage photography in respect of the traditions of the indigenous people? I did ask at the cloaking desk, and was advised that photography is allowed in the museum – on the proviso that you don’t use a flash. On level 1 was a display of Pacific Island cultural artefacts. Most fearsome peoples! But very talented weavers. Level 2 was my favourite, containing the best display of (South) Australian fauna I’ve ever seen. Instead of having crowded cases of animals grouped by Order, Family and Genus (i.e. by family trees), the displays showed a sample of fauna in a natural setting. 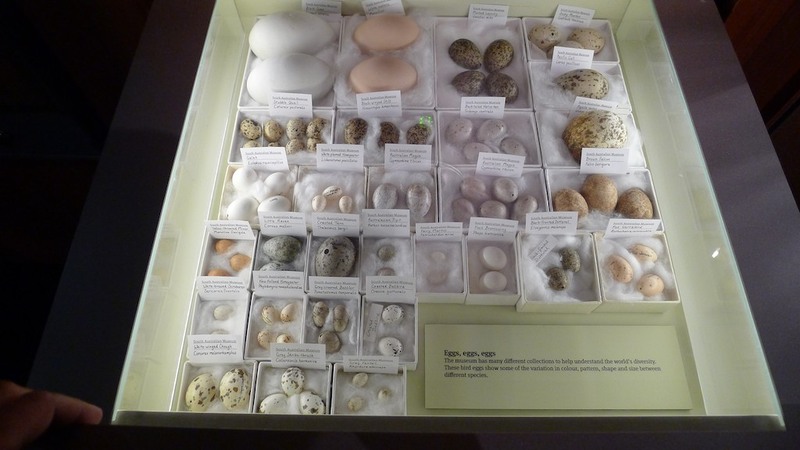 Mammals, birds, reptiles and insects all in the one case together. Beside the animal is a number; using the interactive touchscreen panel in front of each case you can find out more about each animal in the case – and check you haven’t missed any! It’s interesting for young and old because each display is a treasure hunt. You mightn’t be all that interested in reptiles, say, but if they’re in the case with the mammals then you’ll take more notice of them than you would otherwise. In addition to the cases are unlabeled draws under some of the displays. Not labelling the draws was one of the best ideas someone had. Through curiosity we learn. I learnt that the first draw I opened held treasure more wonderful than gold! A draw full of treasure! Birds eggs! None of the other draws were quite as good, but maybe I’m biased… here are a couple more. What do you think? There were plenty to investigate. It’s not just about terrestrial animals; the displays showed everything from the arid interior to the coast and then underwater to the reefs then into the deep. They even have a specimen of the world’s second largest shark, a Basking Shark! Like the Whale Shark it’s a filter-feeder, but unlike the Whale Shark it’s not beautifully dappled, just simply grey and huge, covering almost the whole length of the back wall. It was getting a bit crowded for a good photograph, though, so I moved on. The top floor, Level 3, was packed with the most exhibits; an Egyptian Mummy exhibit, an opalised fossil and dinosaur bones display (I love opals! ), the traditional gem and mineral display, a travelling Mawson/Antarctica exhibition, a space suit, and rocks – or moulds or rocks from Wilpena Pound showing evidence of very ancient sea life in this part of the world. 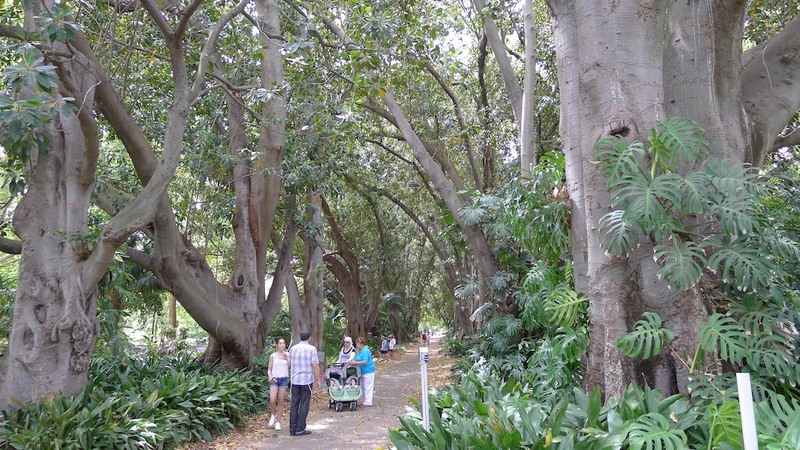 Venturing back out into the fly-blown streets again (ok, it wasn’t that bad, but they are really pesky), we walked down to the Botanical gardens. 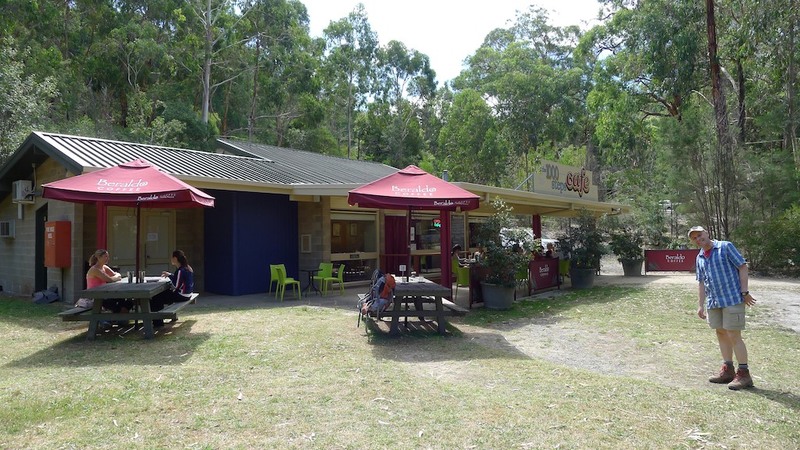 We thought to cut through to the National Wine Centre of Australia and have a bite to eat there, but despite the brochure saying it was only closed Christmas Day and Good Friday we found that – this year at least – it was also closed on New Years Day. Oh well, so much for that. Next time perhaps. Walking back into the centre of the gardens to find a cafe, we passed what will be a very nice wetlands area – when it gets some water in it – and came across the Bicentennial Conservatory which contains within it a mini ‘ tropical rainforest’. I’m not entirely sure what everyone’s fascination is with trying to recreate tropical rainforests away from the tropics. Tropical rainforests are important because they’re biodiversity hotspots, but how many threatened or endangered plants are going to be saved in these hot houses? Are they really that representative of the real thing? Or are they just there to remind people that we have to conserve the real ones? Anyway, it’s always nice to walk through the cooling mist. This is not a wishing well! Nor are there carp in the pond. Back outside, we once more picked up the trail that leads the devoted follower to food. As you should know by now, I love a shaded path, and this one looked a beauty… but lunch was just ahead in another direction. We didn’t know about the Museum of Economic Botany before we sat outside it to eat lunch. Intrigued by the title we decided to have a look inside – and we’re very glad we did. Inside this marvellous building is an example of probably every plant you can possibly think of associated with agriculture and forestry. Some of the samples are real and preserved, some of them, like the fungi, are paper mache to better record shape and colour of the specimen. Back out into the heat, it was a short stroll to the Amazon Waterlily Pavilion (which was also quite warm inside). It wasn’t the largest lily house I’ve been in, but it’s certainly quite a lovely one. A young Amazon Waterlily pad – note the spines! When I first learnt about London’s Crystal Palace built in the mid-1800’s I was amazed and thought it would be wonderful to see such a structure even in this day and age. The Palm House is barely a garden shed compared to that building of course, but compared to similar contemporary structures it’s reasonably large and quite grand. Being a glass house, it is notably warmer and more humid inside…and it wasn’t even a particularly hot day – for Adelaide! Actually, it felt like a pretty average summer day in Brisbane. Check out the thorns on this! On our way our I stopped quickly to photograph these lovely Sacred Lotuses in the Nelumbo Pond (Nelumbo being the genus name of the Sacred Lotus) – not that I knew any of that at the time. Preparing a post for your blog can be quite educational (not to mention time consuming). The flowers are very pretty though, aren’t they? The predicted showers had arrived and although it wasn’t much cooler immediately, by the time we’d caught the tram that night to Glenelg it had cooled noticeably. No chance at seeing the sun set over the water tonight. Despite my fears that hardly anything would be open, Glenelg was in full swing so there were a number of places to choose for dinner. After a very nice plate of seafood we caught a tram back again. It’s only about a 30min ride. The trams are nice and new and there’s a security officer on every tram. There may only be the one line (so restaurant trams are out of the questions for now) but for what they’ve got I think they’re doing really well. They’re pretty similar to Melbourne trams. Only a Melburnian would probably be able to list the differences. 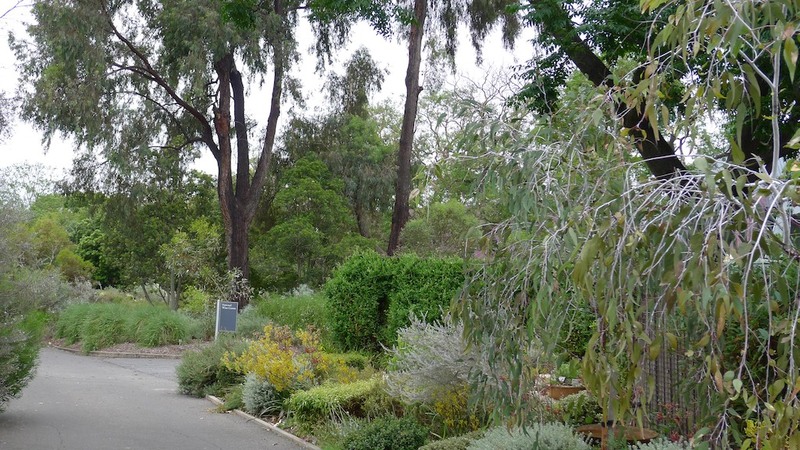 Categories: Adelaide, Holiday | Tags: Adelaide, Adelaide Hills, Adelaide Trams, Amazon Waterlily, Bicentennial Conservatory, birds eggs, Botanic Gardens, echidna, Flinders Column, Glenelg, Harndorf, koala, Mt Lofty, museum, Museum of Economic Botany, natural history, Nelumbo nucifera, oology, opalised shells, Palm House, RM Williams, SA Museum, Sacred Lotus, scenic drive, South Australia, taxidermy, The Hills Cider, tourist drive, Tram, Udder Delights | Permalink.